With the close of trading today, the first half of 2014 is now in the books. The months seem to click by more quickly each year. As the below index return chart shows, the indices displayed all have relatively healthy returns except for the lagging small cap index. The return data was obtained from S&P Dow Jones Indices and their report had very few negative returns for the indices they reported on. While many investors were and remain under weighted in international stocks, those markets had respectable returns as well. From a sector standpoint consumer discretionary stocks were the laggards while the energy and utilities sectors generated strong first half returns. The utilities strength can be attributed partly to the decline in interest rates since the start of the year as utilities are viewed as bond proxies by some investors. The 10-year treasury rate began the year just over 3.0% and closed today at 2.5%. As rates decline the price rises. Investors should keep in mind though, utilities really are not bond proxies as they will act like equity in an equity market correction. Our upcoming summer newsletter will cover a more in depth discussion about the second quarter, and more importantly, our thoughts for the second half of 2014. 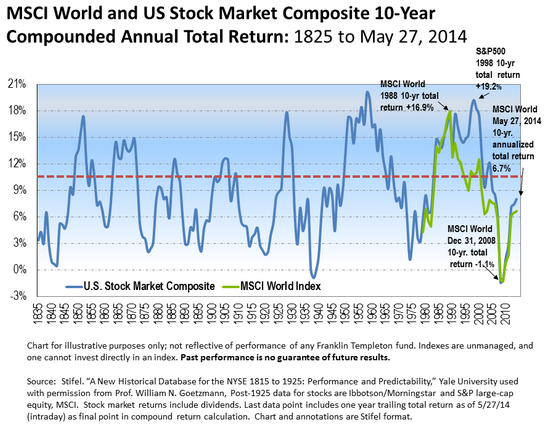 I wrote a post a few days ago that highlighted the 10-year annualized returns for the U.S stock market and the MSCI World Index. 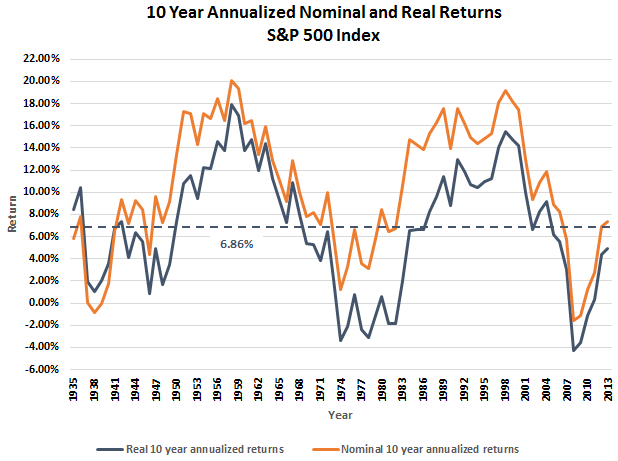 The summary of the article and the chart was the 10-year annualized market returns remain below their long term averages. A number of our articles are published on SeekingAlpha as was the one just mentioned. One comment to the SeekingAlpha article raised the question that the real returns may display a different result. 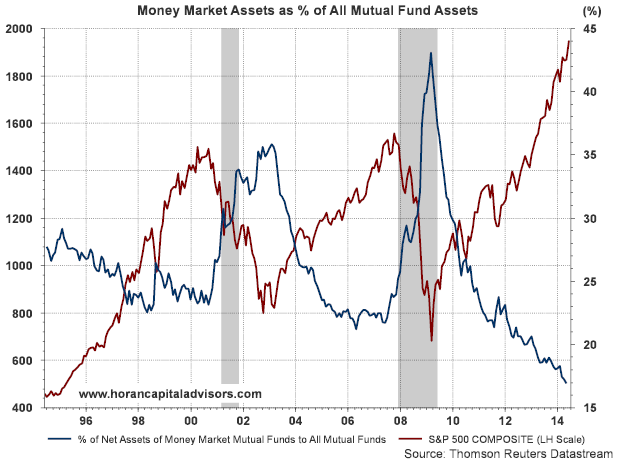 In short though, the real versus nominal returns, on a ten year time frame, were not vastly different as can be seen in the below chart. I believe a part of what has investors concerned about the current market at this time is the strength of the market's recovery since the depth of the financial crisis in 2008 and 2009. Additionally, the recent market advance has occurred nearly on an uninterrupted basis, i.e., without a significant correction. The strength of the recent market move is evident in the below chart that looks at the 5 year annualized return for the S&P 500 Index going back to 1926. 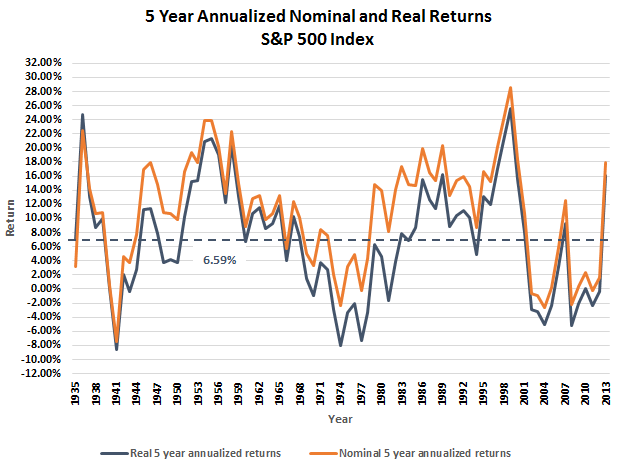 On this shorter time frame, the rolling 5 year annualized return is far above the average of all the five year returns. Certainly important economic data released recently raises questions about the sustainability of the current economic recovery. As cliche as it may be, we to believe the weather experienced across the U.S. in the first quarter of 2014 was a major contributor to the weaker GDP report released last week. In the event we are wrong about the weather influence in Q1 reports, as an investor, if you have a longer term time horizon, the 10-year chart would suggest the market is in for further highs on this ten year time frame. For investors with a shorter time horizon, an equity market pullback should not be a surprising occurrence; therefore, a expectations should be set accordingly. To this point though, and as we highlighted in one of our weekend magazine articles by Aswath Damodaran, Ph.D, a Professor of Finance at the Stern School of Business at New York University,he wrote an article about market valuation and concluded market timing can be a difficult endeavor. "On a personal note, I have never found a metric or metrics that allow me to have the combination of conviction that a bubble exists, that the correction will be large enough and/or that the correction will happen within a reasonable time frame, to be a market timer. Hence, I don't try! You may have a better metric than I do and if it yields more conclusive results than mine, you should be a market timer." So, as the holiday trading week begins enjoy some article links in this week's magazine below. 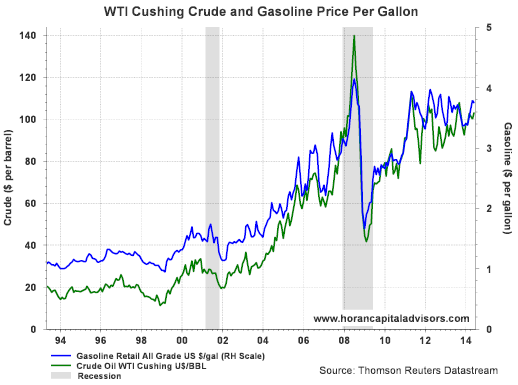 For those that drive a car, they are certainly feeling the effects of higher gasoline pump prices versus four or five years ago. As the below chart shows, however, average gasoline pump prices have been on the decline (barely) since the beginning of 2011. This attempted decline, or at least stabilization, is occurring in an environment where the price of a barrel of crude oil is trending higher. The significance of oil price inflation is the fact only one recession was not preceded by, or coincident with a rise in oil prices. We highlighted the significance of oil prices in our post, Signs Are Not Pointing To A Double Dip Recession Yet, in July of 2010. 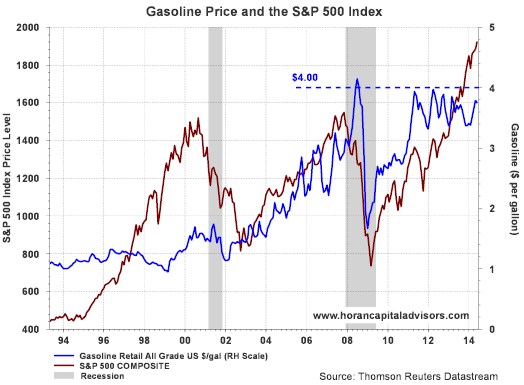 Since 2008 the pump price that seems to be one that can trip up the equity market is around $4.00 per gallon as is evident in the below chart. Although pump prices have been volatile since 2011, the per gallon price trend does appear to be moving lower. As politicians on both sides of the aisle so often do, they cannot resist raising taxes. Just about a week ago a bipartisan Senate proposal is recommending raising the federal gasoline tax by 12 cents and indexing it to inflation. With the $4.00 level being a critical one, this proposal seems like one that could tip the scale of the economy towards a recession for sure. 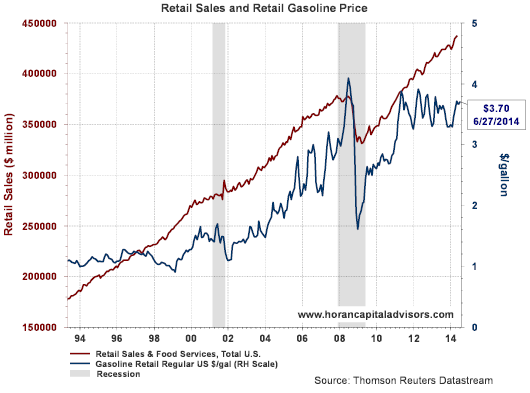 Lastly, higher gas prices do impact retail sales. If one looks carefully at the below chart, as the price of a gallon of gas has neared $4.00 per gallon, retail sales seemed to spike dip lower. With consumers accounting for 70% of GDP or the economy, a higher gas tax does not seem to be a sound policy decision at this point in time in my view. Franklin Templeton Investments published recent commentary on their positive view of equities both in the U.S. and in Europe. The entire article is a worthwhile read; however, one chart included in the write up was the one below showing 10-year annualized returns going back to 1825. As the chart shows, in spite of the strong bull market in equities around the world send the bottoming of the financial crisis in 2009, the compounded 10-year annualized return remains pretty far below average. The market's recovery since the end of the financial crisis seems to have occurred almost without any significant pullback. As the above chart shows though, a pullback or correction would not be an uncommon occurrence. However, timing the market is difficult and technically speaking, further highs in equities seem more likely than not. A key to further equity market strength will be positive developments on the economic front. The coming shortened trading week will see a large number of economic reports release that should shed some light on the state of the U.S. economy. Earlier this week Factset Research (FDS) released their Cash & Investment Quarterly for the S&P 500 Index covering the first quarter. Notable was the near 46% growth on a year over year basis in shareholder distributions (dividends plus buybacks) totaling $193.8 billion. The report also notes share repurchases alone were higher by 50% in the first quarter. "Aggregate Cash Grew 7%: The S&P 500 (ex-Financials) cash and marketable securities balance grew 6.6% year-over-year to a balance of $1.34 trillion at the end of Q1. However, cash declined sequentially by 4.7%, primarily as a result of Verizon Communications (VZ) closing its acquisition of the remaining stake of Verizon Wireless." "Free Cash Flow Grew 9%: Cash flows from operations amounted to $282.0 billion in Q1, which marked an increase of 7.4% year-over-year. Free cash flow to equity increased by 8.7%." "Capital Expenditures Grew 6%: Capital expenditures (“CapEx”) accelerated growth to 6.2% in Q1. In the past four quarters, growth had not exceeded 1.5%. Analysts project that the 2014 growth rate for CapEx will be 6.7%, but also predict it will turn negative in 2015 (-1.2%)"
"Net Debt Issuance Positive for Fifteenth Straight Quarter: Cash inflows from net debt issuance were positive for the fifteenth straight quarter. Inflows of $74.1 billion were the second highest quarterly amount over that period." The growth in capital expenditures is noteworthy as it does not include expenditures that are attributable to acquisitions. The entire report is worth evaluating as it provides insight into the cash generating capability of companies in Q1 in spite of the weakness that is being blamed on the winter weather. Last week continued to see equity markets in the U.S. move higher. All major U.S indices were higher by greater than 1% on the week with the Russell 2000 (small cap) advancing 2.2%. 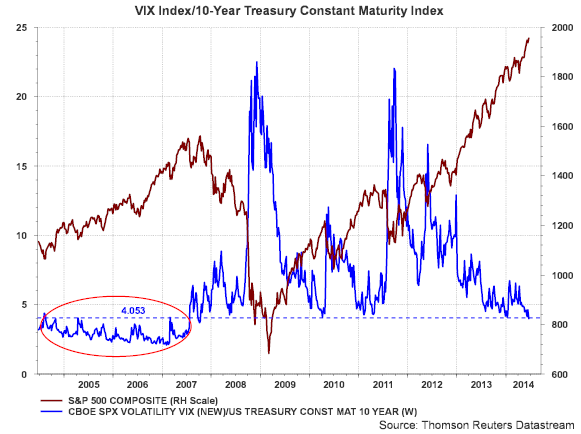 This advance has continued in spite of the often cited complacency evident in the market, vis-à-vis the low level of the VIX, and the lack of a meaningful correction over the past few years. As we noted in a post earlier this week, we do believe the market has entered the "denial stage" from a sentiment perspective. As our clients know, we eliminated small cap exposure in November of last year due to valuation concerns. And in spite of the strong advance for small company stocks this week, and it has occurred on lower volume, we continue to believe the recent small cap strength is more of a technical bounce than a longer term move higher. As the below chart of the Russell 2000 ETF (IWM) shows, the index is approaching resistance around the 120 level. 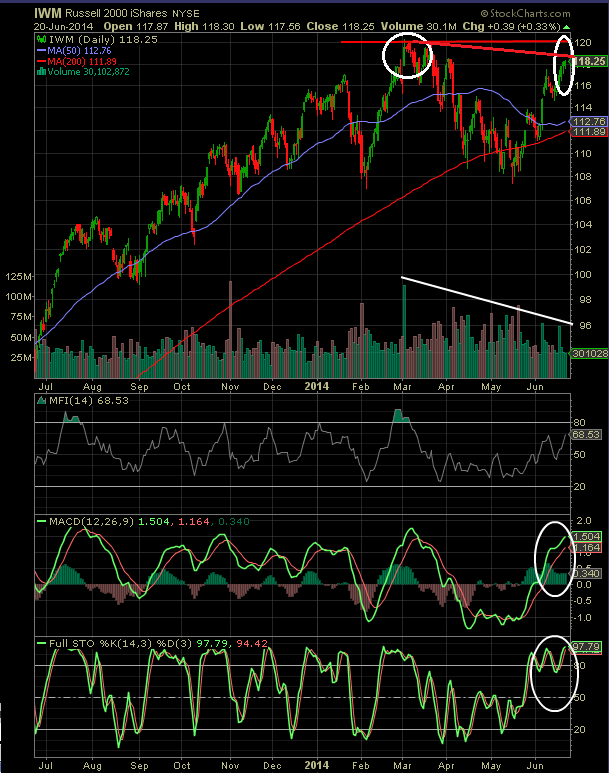 Additionally, a number of technical indicators like the MACD and stochastic indicators suggest small caps are over bought and may be due for a further move to the downside. 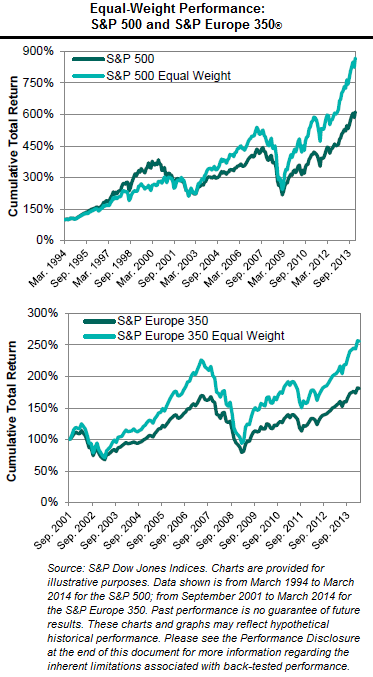 Similar technical comments could be made for the S&P 500 Index; however, large cap valuations are not at the stretched level as are small caps. From an economic data perspective this week, focus will be placed on the final GDP reading on Wednesday. The second reading last month saw GDP for the first quarter revised lower to a negative 1.0%. The consensus estimate for the final reading on Wednesday is -1.8% with a low estimate of -2.4%. Much of the first quarter weakness has been blamed on the severe weather across the U.S this winter. ...just looking at the revisions and forward estimates around SP 500 earnings. The fact is, despite the negativity, S&P 500 earnings are growing at mid to high single digits, and starting to improve. John Butters of Factset and now Gregg Harrison of ThomsonReuters have started to write about the lack of downward pressure on the q2 ’14 expected earnings growth rate of 6.6%. That same q2 ’14 estimated growth rate was +8.5% on April 1, 2014. Certainly, if "feels" as though the market is overdue for some type of correction. However, we know corrections do not occur because they are overdue. A trigger is needed. Ryan Detrick wrote an article on See It Market today, Is Market Sentiment Signaling A Major Peak In Equities?, that provides good insight into market sentiment at this point in the market cycle. Additionally, we do believe company fundamentals are supportive of further stock gains through the balance of the year; however, a pullback would not be a surprise. Below is the link to this week's Week Ahead Magazine that contains articles we hope you find of interest this week. Many of the market statistics that measure investor sentiment suggests investors have become too complacent regarding this bull market. Strategist view this complacency as a contrarian indicator which raises a cautionary flag regarding further advances in the equity market. With the VIX Index trading at a record low level under 11, this index does indicate there is a low level of fear in the market. 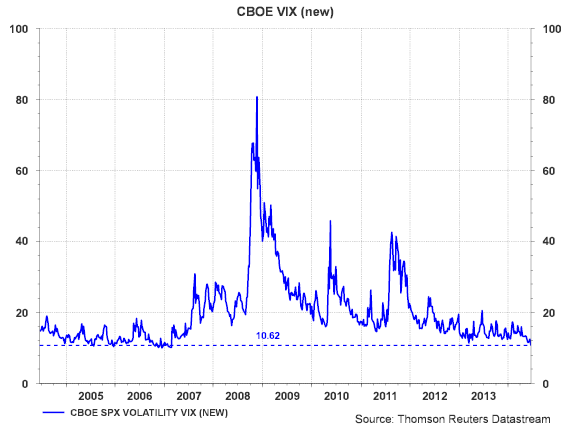 More detail on the VIX can be reviewed at one of our earlier posts, What Is The VIX Index. Importantly for investors is the fact the VIX Index can trade at low levels for a multi-year time period as the above chart shows occurred from 2005 to early 2007. Another sentiment measure that attempts to incorporate anticipated economic activity is to divide the VIX level by the 10-year treasury yield. We discussed this in a November 2011 post, Fearful Investors. A low level in the 10-year treasury yield indicates bond investors generally have an anemic growth and inflation outlook over the longer term. Looking at this indicator it to has reached a current low level of 4.05. However, as with the VIX, this indicator can trade at a low, if not lower level for an extended time period as well, 2005 - 2007. So what does this all mean for investors. At HORAN we certainly do believe, or maybe better stated, "feel" as though a correction would be good for this market. We do believe if a correction occurs it will be a short lived one absent an unanticipated shock to the market. Inflation, CPI, was reported at a higher than expected level on Tuesday. If inflation continues to surprise to the upside, it will likely be driven by higher commodity prices and higher wage rates. This would generally occur with an economy that is strengthening. 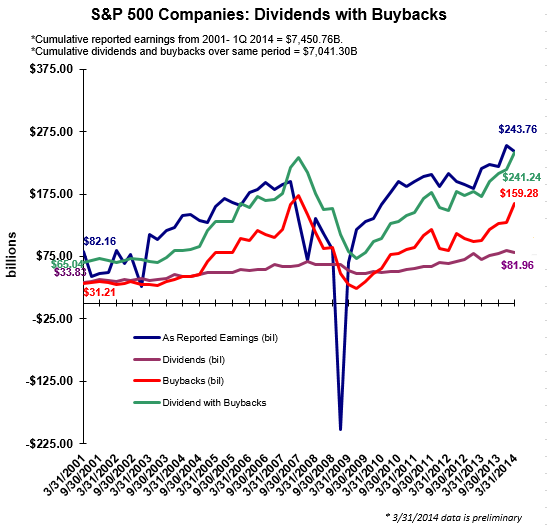 The result would be higher earnings growth for companies, which is needed based on Q1 earnings. The higher growth rate would likely lead to higher stock prices as well. To be certain though, the market does not move higher in a straight line. Our belief though is the market is at a greater risk of moving higher through year end than moving into a sustained downtrend. 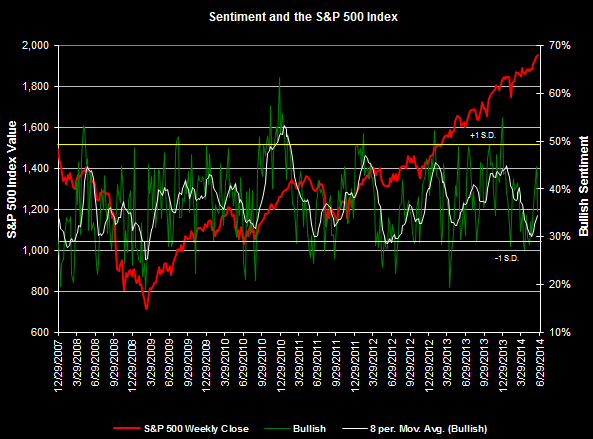 Lastly, we do look at these sentiment readings in the context of the overall sentiment cycle. In a July 2009 post, Where Are We In The Market Cycle?, we included the below chart. The above sentiment cycle chart was first published in 1991 by technical analyst Justin Mamis in a book titled, The Nature of Risk. We believe we are most likely in the "denial" phase of the sentiment cycle. We do not believe full confidence or enthusiasm has returned to this market. This week's Investor Sentiment Survey reported by the American Association of Individual Investors saw bullish sentiment fall 9.5 percentage points to 35.2%. The less volatile 8-period moving average is 34.7% and is not an overly bullish reading as can be seen in the below chart. Given the amount of chatter about the need for a correction, a capitulation type buying frenzy seems not to have occurred yet. "The lower share count pushed up earnings per share significantly (defined as a 4% impact) for 99 issues in the S&P 500, with the Q1 poster child being Apple." "The key question for Q2 is did they do it to boost a poor Q1 earnings period that was impacted by weather conditions, or was it a shift towards more enhanced earnings via share count reduction, similar to what we experienced in 2006 and 2007?" The second trading week of June saw most U.S. broad market indices down less than 1% on the week. Only the Russell 2000 small cap index has a year to date negative return of -.1%. 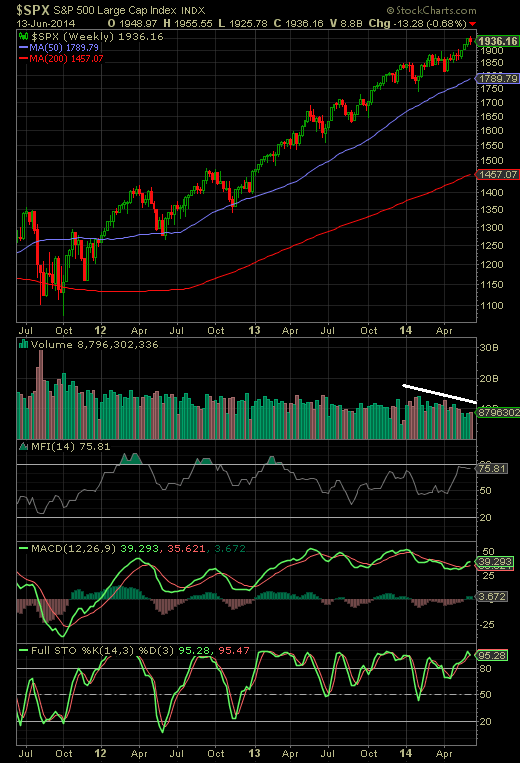 As the below chart of the "weekly" S&P 500 Index shows, the market has been in a strong uptrend since late 2011. Missing from the advance this year is significant volume during up weeks for the market. This seems to be indicative of investor skepticism about the market's continued advance without a 10+% correction which last occurred mid year 2011. As noted above, the Fed begins a two day meeting on Tuesday. For insight on expectations, Bill McBride at the Calculated Risk blog provides a pretty good summation of expectations coming from the Fed meeting. Lastly, below is the link to this weeks magazine. 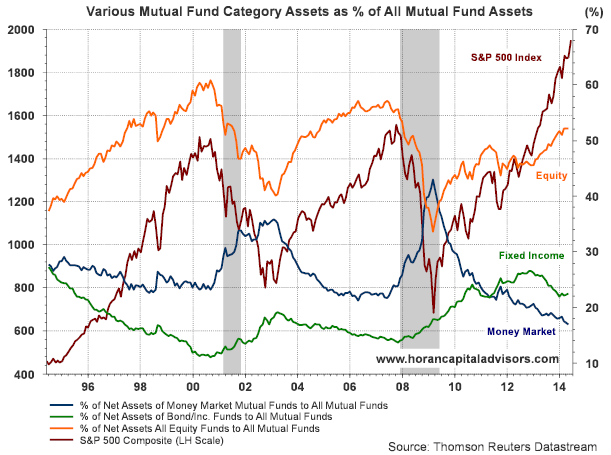 "While cap-weighted indices measure many things, there is (at least) one important thing that they do not measure. The return of a cap-weighted index represents the performance of the average invested dollar, not the performance of the average stock. What is the average stock’s performance? The process of adding each stock’s return and dividing by the total number of stocks is precisely how the return of an equally-weighted index is calculated." One important aspect of the white paper led to the discussion of "Active Share." Active Share has recently become a more popular topic as the variable provides investors with a data point to evaluate whether their active manager is really a closet indexer. Active share is essentially a measure that indicates by how much a particular portfolio differs from its representative benchmark. The importance of knowing whether your investment manager is employing a closet index strategy has to do with the fact that a closet indexing strategy is one that is difficult to outperform the market on an after fee basis. PIMCO released a white paper late last year, Active Share, Tracking Error and Manager Style, that provides a more indepth discussion on Active Share. For more concentrated investment managers, one holding less than 50 securities, the PIMCO article notes managers with Active Share between 20%-60% would be characterized as having a low Active Share. Active Share over 90% would be considered high. At HORAN, our model portfolio holds 44 positions today with an Active Share of a little over 80%. The S&P 500 Index is our benchmark for our individual stocks, yet we have positions in eight stocks not represented in the S&P 500 Index. These eight positions account for 16.6% of our individual large cap equity weighting. Additionally, there are several larger S&P weighted positions we do not hold. In conclusion, active share is only one measurement statistic investors can evaluate when comparing investment managers from one another. Just as a high Active Share can provide a manager with a greater likelihood to outperform their respective benchmark, it could also result in a greater likelihood to underperform. As noted in the PIMCO white paper, Active Share does affect idiosyncratic risk or that risk that can be mitigated by diversification. On the other hand, PIMCO notes there is no link between active share and systematic risk. Systematic risk is undiversifiable risk or market risk. The resurgent conflict between the Sunnis and the Shiites in Iraq has raised the issue of its potential impact on investment markets. Additionally, this weekend it is being reported that the U.S. is moving an aircraft carrier into the Gulf. Of course, this would enable the U.S. to launch airstrikes within Iraqi territory. 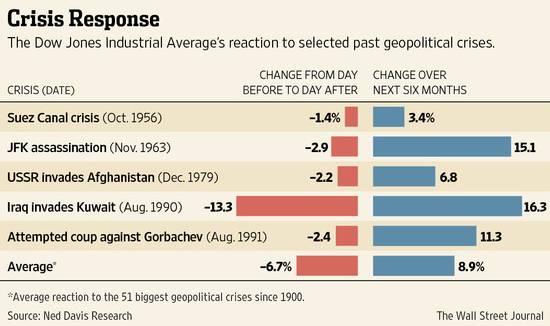 Investors will need to keep in perspective the impact these crisis events historically have on equity markets. At the time the issues in Syria arose, S&P Capital IQ prepared a report titled, Shocks & Stocks. Earlier this year we wrote a post, Market's Reaction To Geopolitical Events, that highlighted some of the information contained in S&P's report. One item that was referenced from the report was the below table. As can be seen above, the initial reaction to crisis events for the S&P 500 Index is negative; however, the median recovery days for the above events is 14 days (the average is 72 days.) Additionally, The Wall Street Journal prepared an article in early May that included a chart prepared from Ned Davis Research data. The chart below shows the initial negative market impact of a crisis, but six months following the crisis event the market, on average, is higher by 8.9%. For investors, selling after the crisis takes place has generally not been a rewarding one. Additionally, the events that tend to have the most negative and longer lasting negative influence on the equity markets are those that impact the financial markets directly like the Lehman bankruptcy in 2008 and the program trading event in 1987. If the Iraqi situation draws a military response from the U.S. and the market reacts negatively, this may be a buying opportunity for investors holding excess cash and/or overweight in bonds. Many of last week's economic reports were positive and the market seems to be satisfied with a 200,000 handle on the non farm payroll reports. The ECB came through on the monetary stimulus front which included a negative rate of interest on reserve deposits at the European Central Bank. Auto sales exceeded expectations in May and some below this is due to roll off of the Cash for Clunkers program from 2009. Positive reports were delivered for the manufacturing and non manufacturing PMIs. Importantly, new orders and backlog within the manufacturing report were strong. Looking at the week ahead economic reports are expected to be on the light side. Jobless claims are reported Thursday along with retail sales. PPI is reported Friday. With respect to retail sales, the Week Ahead Magazine contains a link to a Thomson Reuters AlphaNow article that covers the recent improvement in retail sales. Lastly, several articles cover the fact the U.S. equity market does seem extended on a short term basis. However, outside of some unforeseen external shock, any correction may likely be viewed as a buying opportunity. Below is the link to this week's magazine. We noted in an early March post that dividend payers in the S&P 500 Index were under performing the non payers by over 600 basis points during the first two months of 2014. Near that same time the market was beginning a transition out of momentum and growth stocks into value oriented equities. 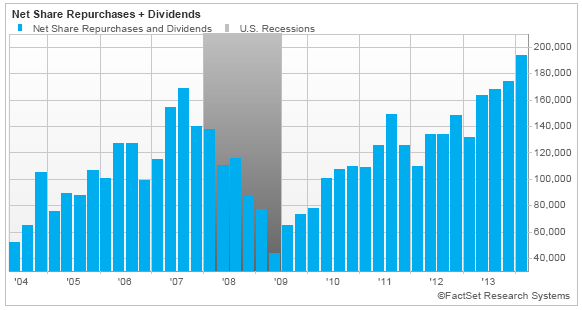 As fate would have it, many dividend payers screen as value type stocks. As a result, since the end of February, the dividend payers have significantly outperformed their non dividend paying counterparts in the S&P 500 Index. As the below table shows, the dividend payers are now outperforming the non payers by nearly 400 basis points. This is a nearly 1,000 basis point swing in just three months. Much has been made of the decline in interest rates since the start of 2014. Many investors expected interest rates would continue to rise as a result of the Fed's "taper" announcement in May of last year. The market action subsequent to the taper announcement certainly saw the yield on the 10-year Treasury rise, ultimately reaching over 3% at year end 2013. 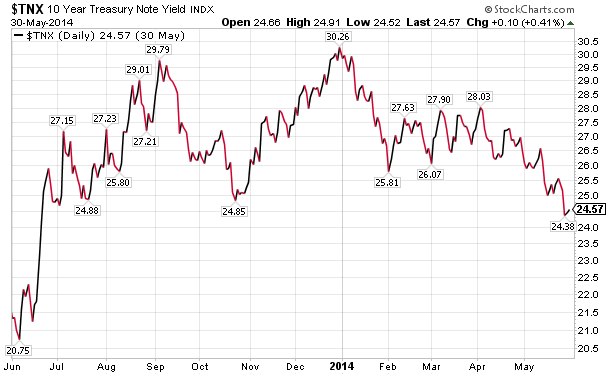 So far in 2014 though, the yield on the 10-year Treasury has managed to decline to just under 2.5%. 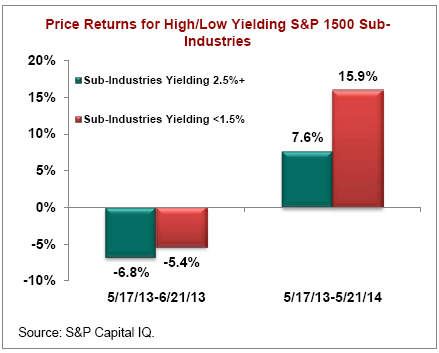 In a recent report by S&P's Sam Stovall, he notes the higher yielding (2.5%+ yield) sub industry groups delivered the worst performance following the Fed's taper comment. Additionally, for the past one year, the higher yielding sub industry groups performance has lagged the lower yielding (less then 1.5% yield). Will this underperformance by the higher yielders continue as a result of potentially higher interest rates for the balance of 2014? "In a possible preview of coming attractions, S&P Capital IQ thinks investors should proceed with caution, especially those who are starving for yield and seem to be on a constant quest for cash. Our advice is to regard last year’s knee-jerk reaction to higher rates, as well as the restrained recovery, as a possible preview of coming attractions when rates move higher once again." "From April 30, 2013 through the end of the year, the yield on the 10-year Treasury note rose from 1.7% to slightly more than 3%. Now it has drifted back down to 2.5%, in what we believe is a counter-trend rally before moving higher once again as economic data confirm the improvement in U.S. GDP growth. Indeed, Standard & Poor’s Economics, which operates independently of S&P Capital IQ, projects the 10-year yield to end 2014 around 3.1% and creep even higher by the end of 2015 to near 3.5%. In addition, even though history should be viewed as a guide and not gospel, the monthly difference between headline CPI and the yield on the 10-year note during the past 60 years implies a year-end 2014 level that approaches 4%." "Taken from an individual stock perspective, investors should consider returns during the past year, along with valuations, when making investment decisions. S&P 500 companies yielding 2.5% or more recorded an average total return of 11%, versus 19% for all companies in the “500,” and 25% for those yielding 1.5% or lower. Even more telling, is that nearly one-quarter of all companies yielding 2.5% or more are still under water, having recorded a decline in price and dividend in the past year. This percentage of decliners is more than 10 percentage points higher than the average for those companies yielding less. And while valuations (P/E ratios based on forward-year EPS estimates) for the higher-yielding category is currently below the lowest yielding category, they trade at a 20% premium to the middle-yielding group and for the cap-weighted S&P 500 Index." As a final comment on interest rates, many investors have been surprised by the rate decline that has occurred this year. It may seem unlikely that rates will continue their decline from these low levels; however, JP Morgan's net treasury survey shows investors are the most short treasuries since 2006. If investors need to cover their shorts as a result of a further decline in interest rates, the increased treasury demand will push treasury prices higher, i.e., yields decline. 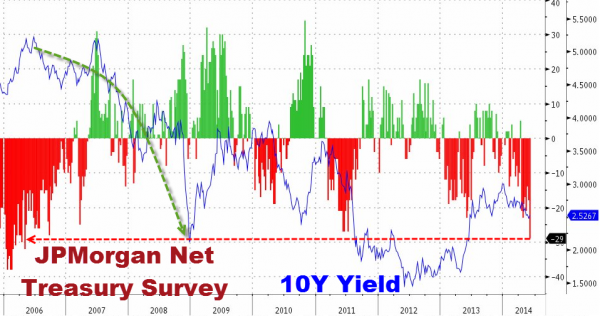 Certainly a lot going on in the bond market that is attempting to prove the consensus wrong. A Preview Of Coming Attractions? So much for sell in May so far. 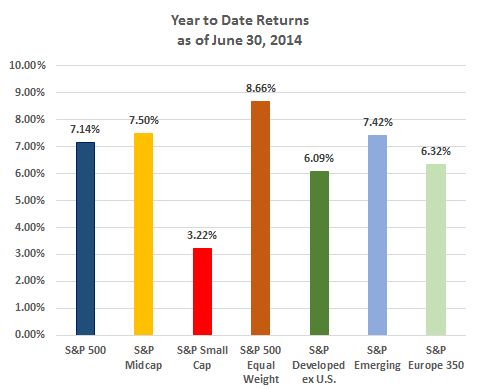 The S&P 500 Index was up 2.35% in May and is up 4.97% for the first five months of this year. The one major S&P Index that is down on the year is the S&P Small Cap 600 Index which is down 1.43%. 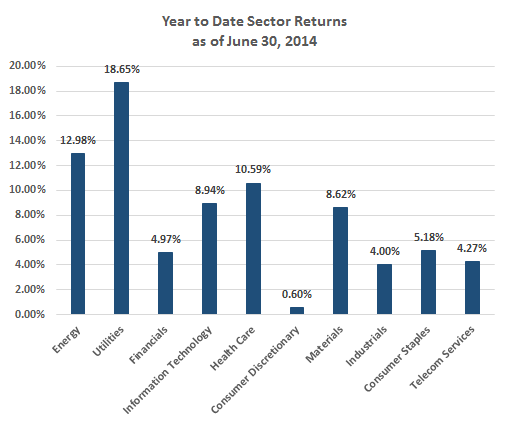 The best performing sector YTD through May is the utility sector which is up 13.57%; however, this sector was down 1.05% in May. A number of economic variables were released last week and one article link in the magazine provides commentary on them. Of some significance was the fact annualized first quarter GDP was revised to a minus 1%. Pundits are attributing the weak GDP reading to the winter weather experienced during the first quarter. As Econoday notes, "Overall, while overall growth was bumped down into negative territory, it was mainly due to less robust inventory growth—final demand was little changed. And the second quarter is gaining strength." A number of key economic data points will be reported this week. All eyes will be on Mario Draghi, President of the European Central Bank. Last month Draghi announced the ECB was ready to counter low inflation and to assist economic growth. It is anticipated the ECB will cut interest rates and deploy other stimulative measures when they meet on June 5th. One potentially controversial measure the ECB may announce is reducing the central bank deposit rate to minus .1% or minus .15%. Essentially this charges banks that have funds on deposit at the ECB. 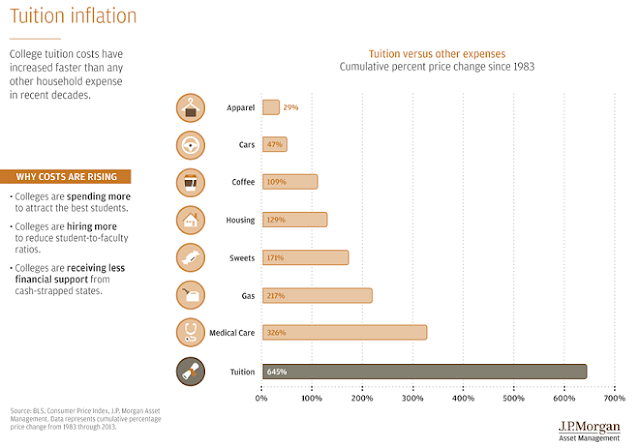 since 1983 college tuition costs have increased faster than any other household expense. 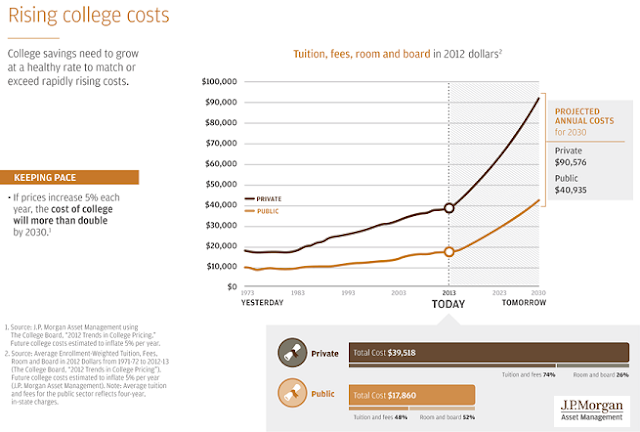 Tuition costs have increased a cumulative 645% versus health care's cumulative increase of 326%. 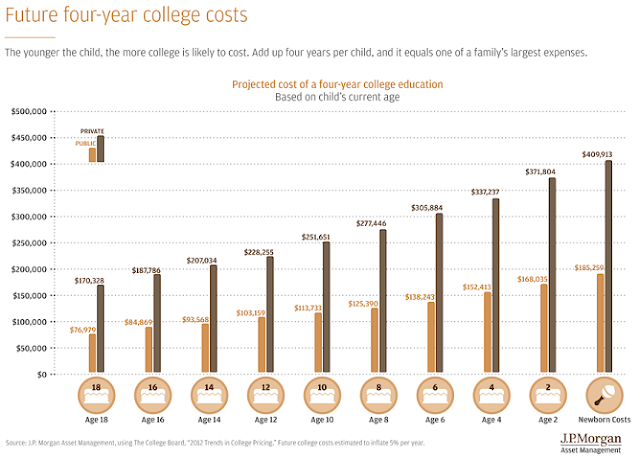 for children born today, the projected cost of a four-year private college education will total over $409,913. The same cost for a public education will total over $185,000. Young families will be hard pressed to save enough funds to finance their children's education costs. In addition to a well thought out saving plan, the dollars saved will need to be invested in asset classes that can generate significant positive returns. In our firm's view bonds will not grow at an adequate rate so families will need to position their investments in potentially better returning asset classes like equities and alternatives.